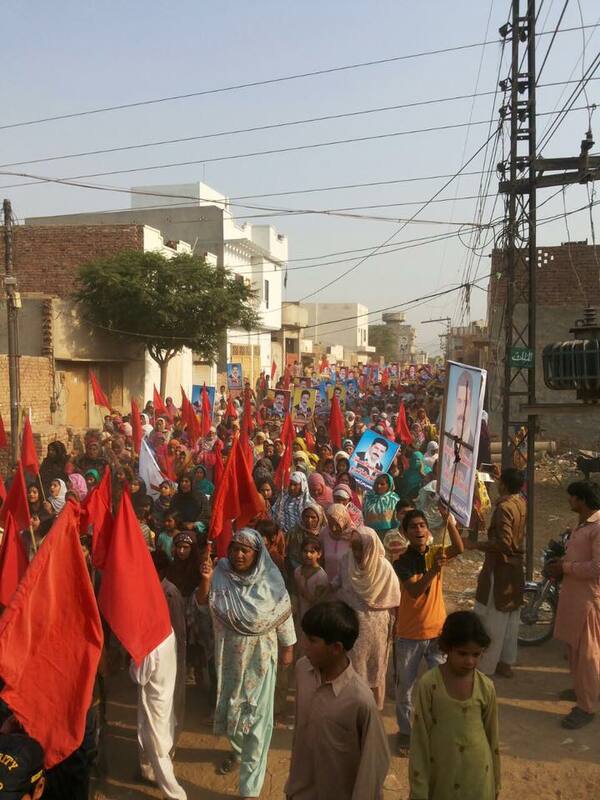 The courageous resistance of Okara’s women - sister-hood magazine. A Fuuse production by Deeyah Khan. The landless farmers of Okara’s military-owned farms have a long history of resistance against the military and land owning classes. The tenants (mazareen) have been tilling the land for over a hundred years. Agricultural and non-agricultural workers from East Punjab were encouraged to settle with the promise of land ownership under the British Raj with the legal status of sharecroppers, a pattern which can be seen all over Punjab. The land was owned by the Imperial Government of Punjab and leased to British Army who paid rent till 1943. After partition, the land was transferred to Pakistani army. In the early 2000s, during the dictatorship of General Musharraf, attempts were made to change it in to a contract-based system, rendering it easier to evict the peasants with very little notice. During Musharraf’s rule laws were passed to further corporatize agriculture. The new contract made the working conditions worse and decreased wages. A farmers’ organisation, Anjuman-e-Mazareen Punjab (Punjab Farmers Collective) was formed to resist defend their livelihood. With the increasing suppression by the state, and detentions of the farmers and peasants under false charges, it was women who rose to the fore-front of the movement. The women protested, raising their thaapas high in the air. Thaapa (a bat used for beating clothes while washing) became their symbol of resistance. ‘Thaapa rakh tayyar kurray’ is the slogan used by the women peasants in Okara: meaning, ‘Keep your washing bat ready girl!’ When the rangers attempted to prevent the harvest from taking place, these women would show up with their thaapas and bar vehicles from entering the villages. The western world’s neo-oriental narratives represent Pakistan and its people in a condescending manner, speaking of Pakistan in terms of bombs, terrorism, and violence. 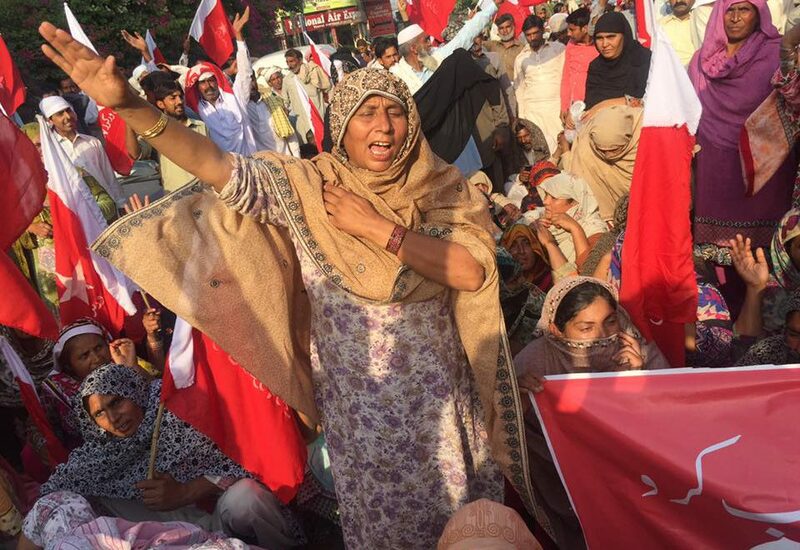 The western world constantly neglects the struggle and resistance of the Pakistan’s people, especially women. The attitude of the western media towards people of Muslim heritage, especially women, is framed in terms of racism and ethnocentrism. The othering of the Muslim women within the western media creates and reinforces the image of a Muslim woman as submissive, obedient and oppressed, neglecting their struggles on ground. The resistance by the women of Okara challenges many narratives about Pakistani women. Thaapa force is not only comprised of Muslim women, but has a significant number of Christian women. The state has harassed these women for resisting. They have, over the years, been illegally arrested harassed and arrested. Badrunisa is one such woman from the Thaapa collective. Badrunisa, a middle aged woman, has nine cases registered against her and several attempts have been made to arrest her. Badrunisa often travels in a burqa to hide her identity from the local police as she moves from village to village organizing the farmers for protests. Despite the threats of violence and the state’s tactics to infuse terror and paranoia, women have refused to surrender. Recently the leader of the Punjab Farmers’ Collective was been taken into custody for trying to organize a rally on International Peasants day. 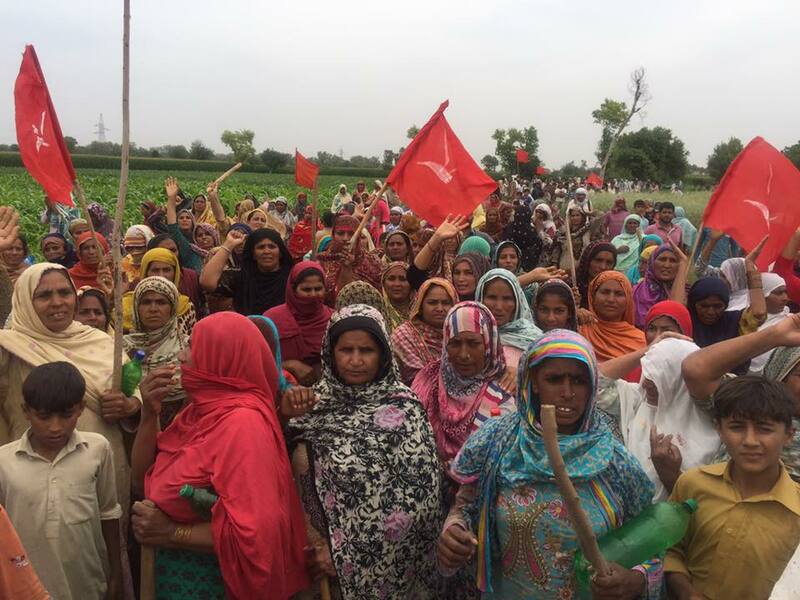 Women farmers planned an all women protest outside the Lahore Press Club on the 20th May 2016 to demand the release of their leader, and their right to ownership of the land. Two vans of women farmers were taken into custody in Okara, while two more vans were stopped outside Lahore. Those who managed to reach the demonstration site somehow were escorted out of the city by the police. A woman told me that they dispersed and travelled in small groups to reach the left-wing Awami Workers’ Party’s Lahore office. The police harassed the women, party workers and student activists but they refused to back down. The women chanted the slogan ‘Maliki ya Maut’ (ownership or death) when they were asked to leave. 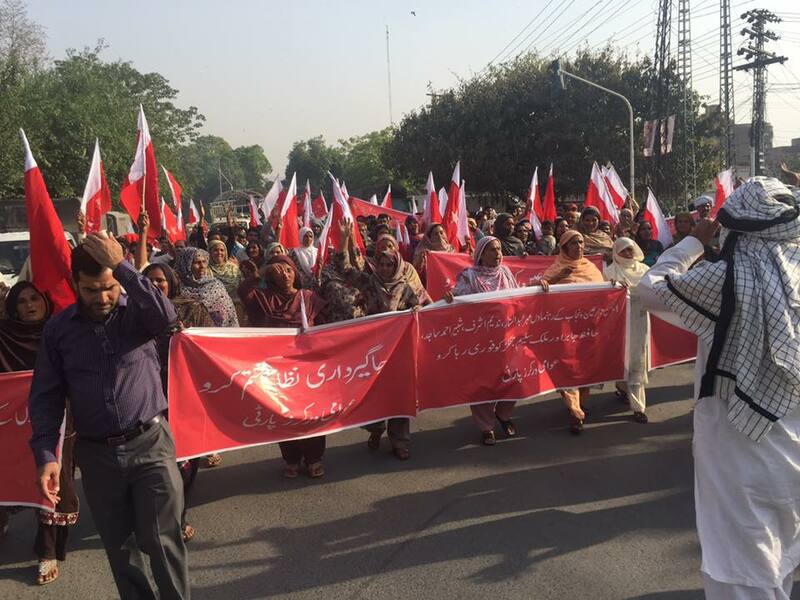 Dozens of women marched on the roads of Lahore demanding their rights. These women’s struggle challenges not only the narratives of the western media about Pakistani women, but also challenges patriarchy locally. According to Shirkat Gah’s documentary, the enrollment of girls in schools has significantly increased after the formation of the farmers’ movement began. The literacy rate has increased since women have become the face of the resistance and attitudes towards women involvement in public spheres have changed to a greater degree in Okara than elsewhere in the country. Gender violence has also decreased significantly with more women taking leadership positions in the movement. Women like Munnawar Bibi, Badrunisa and Akeela Naz are the bearers of the under-recognised struggle for the right to land ownership in Okara. When the state sought to smash the peasants’ movement, it was the women who defended their land. 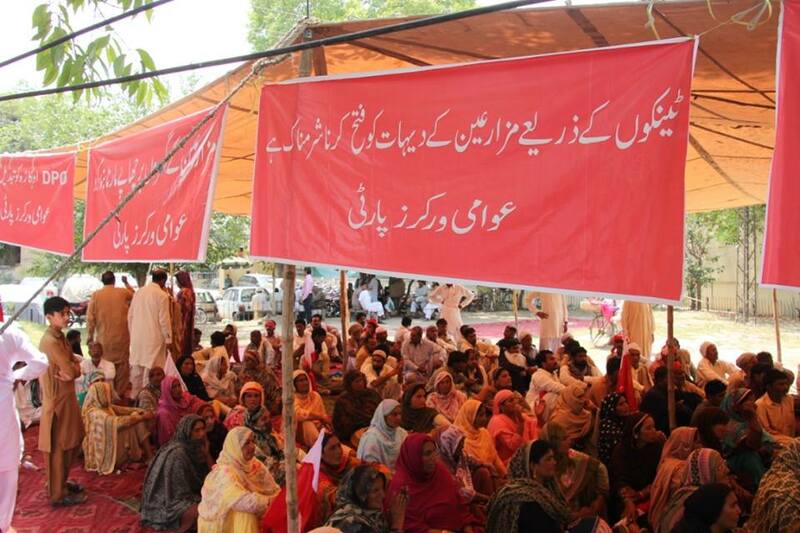 The women of Okara continue fighting the state and its atrocities. Here’s to the struggle of these fearless women. More power to the phenomenal women of Okara! 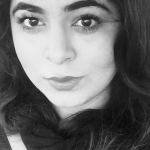 Tooba Syed is a political activist of the left, working primarily on issues of women. By profession a dentist with an interest in political and feminist theory and its practice.